I'm pretty excited and my plan is to go live before our team heads off to Inbound 2015 in Boston. Each time I go through this exercise of improving our homepage I learn a few things about the behaviour of our website visitors, and how a visitor goes from a stranger to a customer. This time around is no different. 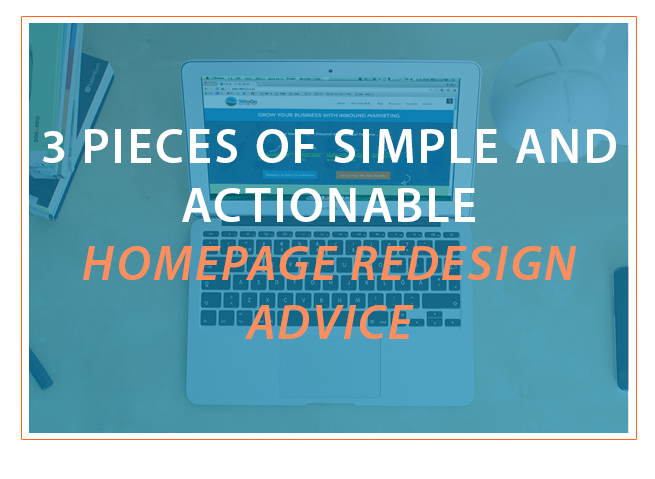 In this post I’m going to share some homepage redesign tips that are uber useful for anyone who is considering working on their homepage, is undergoing a redesign presently, or who just went through a redesign and can still make some final tweaks. Put aside your preference about how you think your homepage should look and flow, and step into your customer's shoes. Knowing what you know about them, their pain points, their needs, and the typical questions or pushbacks they have (all things that are part of a well developed buyer persona): What is the progression of information that they are anticipating to see on your homepage? It's not what YOU want them to see, but what THEY want to see. Often those two things are different, so it's important to approach this project with them in mind. Here’s a simple way to do this: look at your homepage right now and ask yourself whether you’re telling the visitor about you and what you do, or if you’re helping them solve their problem. Your website visitor came to your website with the hopes of relieving a pain point they are experiencing. Be sure to address that pain point on your site. They will reward you for it by engaging with your website and content deeper. There are so many decisions you’ll be making with your redesign that you may not have data to help inform. In those cases you can cut the back and forth conversation (or even arguments), by committing to test certain elements against one another for a period of time, and letting the data make the final decision. You should be constantly testing your website (not just homepage) anyway so that you’re always presenting your most effective site to your visitors. Once you have 1 month of data for your A version and 1 month of data for your B version, you should get a clear idea on which version is the top performer. Rinse and repeat for the other elements you’d like to test. When you design your page with testing and learning in mind, it allows you to make decisions quicker and reduces conflict when you have more than one head involved in the redesign process (which is typically the case), because you’ll be relying on data to make decision and not personal preference. Know the different points that someone visiting your website could be in their buyers journey. not everyone is going to be ready to buy (aka bottom-of-the-funnel), so you want to make sure that you're providing information for the folks who are still in the research phases. Understand what your visitors need to engage with in order to become leads. This requires knowledge of how a prospect became a lead. Did they visit 3 pages on your site, read 2 articles and then download your ebook? If so, then you can intelligently design your homepage knowing that they'll need to see key pages and visit your blog before they become a lead. In this case, prominently placing opportunities to move to those key pages and to visit your blog, on your homepage, is probably a good idea. When you’re approaching a homepage redesign as an opportunity for you to better serve and delight your potential customers, it can be a fun and rewarding process. The goal is to be thinking about them and what they are expecting to see and experience. Each change can serve a dual purpose: enhancing their experience and trust with your brand, improving your chances of attracting them as a lead and customer. The two aren’t mutually exclusive! Have you gone through a homepage refresh recently? Do you have any advice that you learned from your experience? Leave us a comment and share what you learned!